Tru School Sports: Brandon Jennings' Made His Season Debut On Sunday: Does He Make The Detroit Pistons A Playoff-Caliber Team? Brandon Jennings' Made His Season Debut On Sunday: Does He Make The Detroit Pistons A Playoff-Caliber Team? With the return of Detroit Pistons' point guard, number seven, Brandon Jennings, their star core is healthy for the first time this season. The star core from left to right: small forward Josh Smith-number six , centers Andre Drummond- number zero and Greg Monroe-number 10, and Jennings. (orum.expressobeans.com). Detroit Pistons' point guard Brandon Jennings made his season debut on Sunday against the Boston Celtics. With the Pistons' star core healthy for the first time this season, they will attempt to lead the Pistons to the playoffs. The Pistons have been terrible since they last made the playoffs, 2008-2009 season. They have had only one season since 2008-2009 where they won 30 games in a season, 2010-2011. Also, Pistons' head coach Maurice Cheeks is their third head coach since 2008-2009; the other two were John Kuester and Lawrance Frank. Pistons' fans had little optimism for their team to improve in the 2013-2014 season, until their beloved team had a great off-season. In the 2013 off-season, the Pistons signed free agent small forward Josh Smith, played for the Atlanta Hawks and made a trade with the Milwaukee Bucks to acquire Jennings. Both of these players with centers Greg Monroe and Andre Drummond form a star core for the Pistons. The Pistons had a record of 1-1 while Jennings was recovering from an impacted wisdom tooth and a hairline fracture in his jaw at the base of the tooth, according to Vincent Goodwill's twitter handle. At 4:34 p.m. on Sunday, Vincent Goodwill tweeted that Jennings would make his season debut, coming off the bench, against the Celtics. Jennings made an immediate impact in the game, highlighted by his fake pass while driving for a layup. Jennings finished the game 14 points, five field goals made out of 12 attempts, four steals, four assists, three rebounds, and two turnovers in 31 minutes. The Pistons defeated the Celtics 87 to 77. On paper, the Pistons appear to have a playoff caliber team in the Eastern Conference. The Eastern Conference teams that were seeded five through eight last year had records that were worse than their counterparts in the Western Conference. Jennings is a dynamic point guard; whether it is draining jump shots or dishing assists to his teammates. He will be the team's starting point guard when his wisdom teeth and jaw no longer bother him; which would end his restriction of eating soft foods-according to Rotoworld. Smith is a very good post player. He has the size and strength to dominate in the post; whether it is through backing down his opponent or making jump shots on offense or swatting shots and grabbing rebounds on defense. Monroe is similar to Smith offensively except that Smith has a much better jump shot. Luckily for Monroe, he has Smith and Drummond to help him out if he cannot guard his man. Drummond has the potential to be a great post player. His size and strength makes opposing players cautious about trying to score on him because he can easily block their shots. Beside the great starting lineup they have, featuring the star core, they also have a good bench. Their notable players, are veteran point guard Chauncey Billups, shooting guard Rodney Stuckey, small forward Kyle Singler. Billups is key to a playoff run for this team because he has had great success in the playoffs. He is the only player left on the Pistons' roster from their 2003-2004 NBA Finals Champion team. That was the highlight of a six-year stretch, 2002-2003 to 2007-2008, when the Pistons made it to at least the Eastern Conference Finals every year. 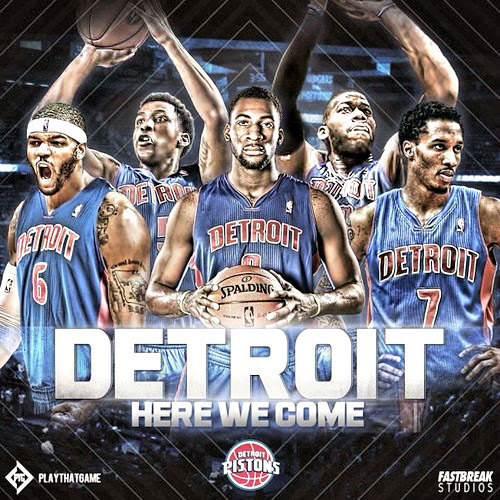 The Pistons play in a tough division with the Indiana Pacers and Chicago Bulls. The Cleveland Cavaliers are also a good team, they defeated the Brooklyn Nets 98 to 94 on Wednesday. The Pistons have a 2-1 record and they have the third-best record in the Eastern Conference; entering Monday's games. They have an upcoming four-game stretch where they face three teams that are expected to make the playoffs. They play the Pacers on Tuesday, the Oklahoma City Thunder on Friday, and the Golden State Warriors on Nov. 12. If the Pistons are able to win at least two of those games, it would convince many NBA fans and experts to believe that they will make the playoffs. can't wait to see if they ca efficiently space the floor with all the new pieces.